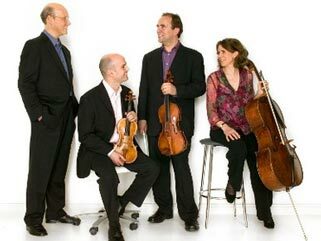 The evening was framed by a short Schubert slow movement with a decorative piano part, and the far more extrovert Dvorak quartet, not one of his best but played with an uninhibited will. More interesting was the exposition of Dvorak's themes than their working out, which tended towards the formulaic, sometimes outstaying their welcome a little (cf. Mendelssohn's midde period Op 44/3 quartet, heard the previous night). Both Schubert & Dvorak were well played by the always reliable Schubert Ensemble, but we all really came for the rarer Enescu. It was good to see a substantial house for this Enescu series, complementing the ongoing Enescu offerings in the Romanian Cultural Institute. George Enescu's second piano quartet manages to unify terseness and lyricism in a condensed manner that typifies Enescu's late style, and is amongst the most personal of his works. As Simon Blendis, the Schubert Ensemble's violinist, pointed out astutely before the performance, a few threads can be detected as constituents of the musical fabric, even if they cannot always be easily traced throughout the work: a folk-influenced main theme, maintenance of a certain Gallic lightness to much of the scoring, subtle re-working and transformation of the initial material. Hard work had obviously been put in by all the players to understand Enescu's unuusually detailed requirements of dynamics and tempo variants. They played with admirable fluency, but this could not hide the fact that it is not easy listening and really demands several hearings. Among several aspects of their performance that stand out were the middle movement's calm opening section, contrasting with the more resonantly stated central section, which tactfully steered clear of any tonal harshness. The third movement coda stood out as a testament to Enescu's masterly skills of construction, repleat with ebb and flow of mood, power and internal driving force." The adventurous listener would do well to investigate either of the two available recordings (Naxos and cpo labels); the Schubert Ensemble will be putting theirs down later this month for release by Chandos later in the year.